Mr. President... Mr. President... C, Set #1, 1987. Silver-dye bleach prints, Set of 10, 14 x 11 inches, print, each. Compromised Magazine / B+W / Cut, 1994. Reassembled magazine with cut collage, 11 x 8.5 inches. 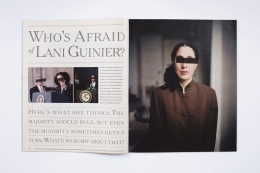 Revised Magazine / New York Times #3, 1994. Magazine with lithography, 13 x 11 inches. 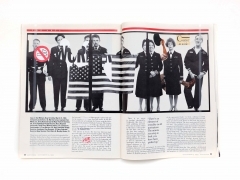 Revised Magazine / Avedon - Newsweek, September 13, 1993, 1993. Revised magazine, 11 x 8.5 inches. Revised Magazine / Maidenform, 1993. Revised magazine, 11 x 8.5 inches. If There Were No Such Thing (from "Whiskey and Cigarettes"), 1990. Silver dye bleach print, 10 x 8 inches, print. 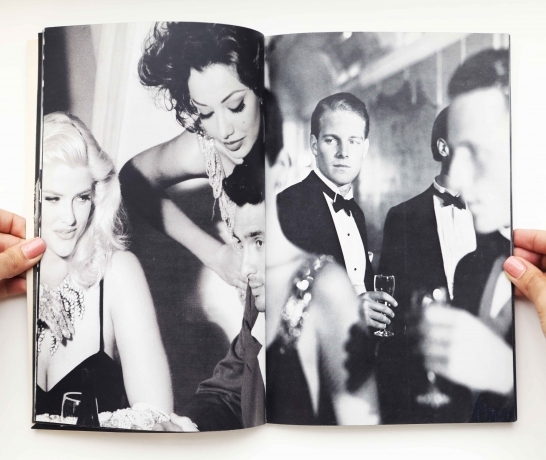 Summer DeParchers (from "Whiskey and Cigarettes"), 1990. Silver dye bleach print, 10 x 8 inches, print. The Joy of Six (from "Whiskey and Cigarettes"), 1990. Silver dye bleach print, 10 x 8 inches, print. What's a Special Evening (from "Whiskey and Cigarettes"), 1990. Silver dye bleach print, 10 x 8 inches, print. 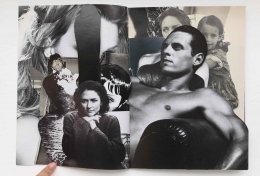 Robert Heinecken, Summer DeParchers (from "Whiskey and Cigarettes"), 1990, Silver dye bleach print, 10 x 8 inches, Unique. “This kind of photograph must be looked at more intensely than one is used to looking at photographs. The meaning is probably not on the surface or necessarily associated with the subject matter. It may be operating on completely unfamiliar levels. It may not even seem understandable. 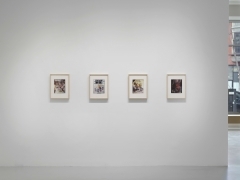 Rhona Hoffman Gallery is pleased to present our third exhibition of works by Robert Heinecken and first since 2012. 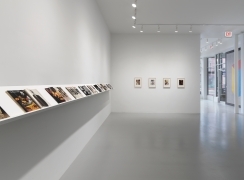 Focusing on Heinecken’s work from the late 1980s and early ’90s, the exhibition features two major photographic works based on a televised Ronald Reagan press conference from 1987. 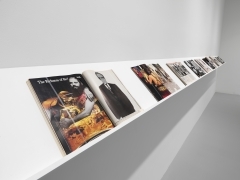 Also on view is a broad selection of Heinecken’s revised and reassembled issues of popular news magazines, such as The New Yorker, Newsweek, Time, and four double-image photograms from the Whiskey and Cigarettes series. 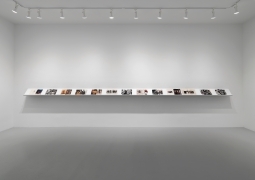 Born in Denver in 1931 and raised in Iowa and California, Heinecken was a pioneer of conceptual photography, influencing generations of artists in his tenure at the University of California, Los Angeles. 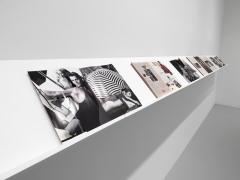 A photographer who rarely used a camera, Heinecken appropriated from advertisements, television, and magazines in order to critique American popular culture, adopting a wide range of techniques to manipulate and recontextualize mass media imagery. He was particularly interested in the visual language of television newscasts, a subject he returned to frequently and with a variety of approaches. 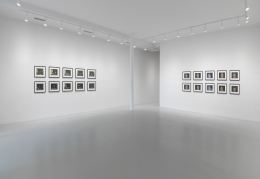 To create his Mr. President… Mr. President… works, from which the exhibition takes its title, Heinecken photographed a live television broadcast of a press conference delivered by Ronald Reagan at the height of the Iran-Contra affair. 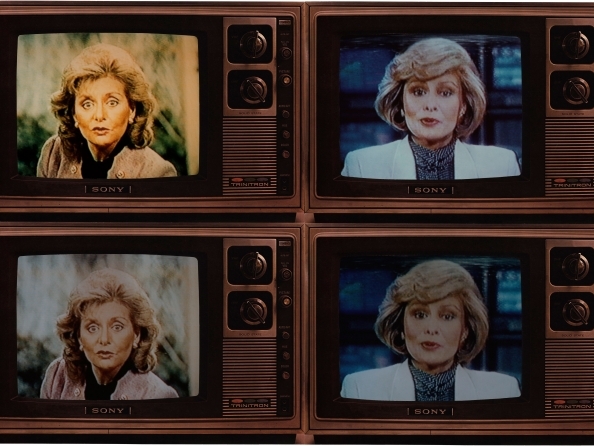 Isolating frames and snippets of text in two grids of ten images, Heinecken created new ambiguous narratives out of the televised speech, commenting on the power of the medium to manipulate public understanding of current events while also encouraging viewers to become active, critical consumers of news. 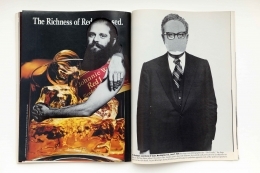 In a similar vein, Heinecken created his “revised magazines” by variously cutting, editing, redacting, and reassembling copies of widely circulated periodicals. 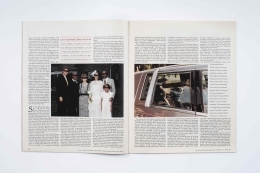 The alterations of the magazines—some subtle, some humorous, and some bordering on violent—create new readings by merging figure and ground, recto and verso, and unexpected combinations of image and text. 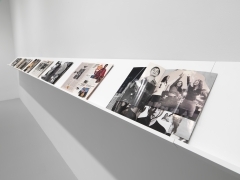 “I tried to use whatever my feelings told me about the material that was being presented to the public and alter it in a specific rather than random way,” Heinecken said about the works. 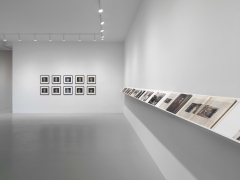 In today’s climate of open hostility toward journalism and the widespread manipulations of “fake news,” Heinecken’s explorations of the power and circulation of photographic media are more critical than ever. Robert Heinecken was a fighter pilot in the US Marine Corp before earning his BA (1959) and MA (1960) at the University of California, Los Angeles. 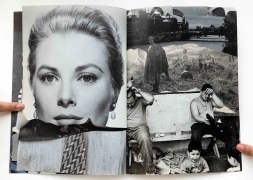 In 1964 he founded the graduate program for photography at UCLA, where he taught until 1991. 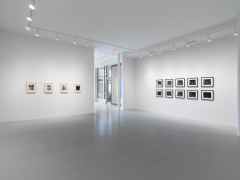 He received a Guggenheim Fellowship (1976), a National Endowment for the Arts Individual Artists Grant (1977, 1981, 1986), and Polaroid Corporation grants to use 20×24 and 40×80 cameras (1984, 1985, 1988). 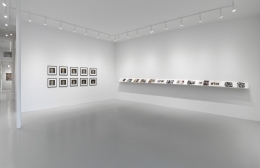 Since 1964, Heinecken has had over sixty solo shows internationally including: the WIELS Contemporary Art Centre, Brussels, Belgium (2014); the Museum of Modern Art, New York (2014); the Hammer Museum, Los Angeles (2014); the Center for Creative Photography, University of Arizona, Tucson, and a 35-year retrospective exhibition at the Museum of Contemporary Art, Chicago in 1998.